To mark the release of Freedom's Goblin, we comb the voluminous Segall catalog. 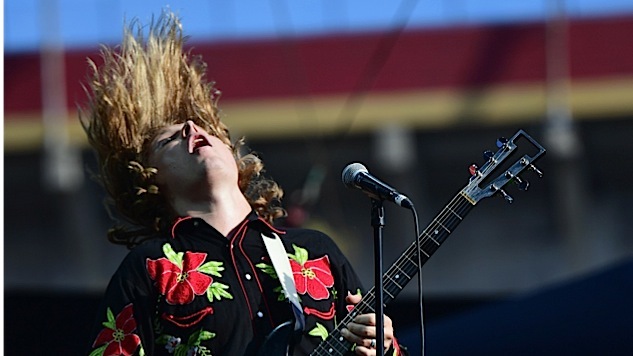 With the release of his new album Freedom’s Goblin, Bay Area garage-psych-punk-rock hero Ty Segall (technically now based in L.A.) is adding a 10th chapter to one of the most extensive and impressive recording catalogs in recent memory. Since 2008, Segall has put out one proper solo album every single year, with the exception of 2015, when he released a live album, a four-song EP, a compilation of T. Rex covers and a full-length record with his band Fuzz. From garage rave-ups (Twins) to classic rock (Manipulator) to unplugged jams (Sleeper) Segall drives in every lane of rock ‘n’ roll, and there few musicians on the planet who do it better, or more often. To mark the release of Freedom’s Goblin—which is already a contender for the best rock album of 2018—we’re gathering all of Segall’s solo albums and sorting them from least awesome to most. We’ve left out live albums, singles and rarities compilations, collaborations with other artists and even albums credited to the Ty Segall Band. Why? Because, man—we’ve got to eat and sleep some time. Unlike Ty. With 12 tracks clocking in at just over 24 minutes, Segall’s first self-titled album, which was shepherded by fellow Bay Area rocker John Dwyer of The Oh Sees, is exactly what it should be: a sonic snapshot of a soon-to-be monster in embryonic form. Ty Segall is a lo-fi jumble of yelps and hiss and choppy guitar chords that show promise, but are clearly still proto-Ty. This fuzzed-out sophomore effort finds Segall stretching out just a bit stylistically, with a couple of acoustic jams (“Lovely One” and “Untitled #2”) and more psychedelic elements (reverb, drone) thrown in. He also peels back just a tiny bit of the fuzz, giving us a better look at his considerable melodic talents. The first time Segall really took his foot off the gas pedal for any prolonged period of time was on Goodbye Bread, a collection of songs that veer a bit more toward his glam and pop sides. The title track, for one, has an easy-going falsetto verse that ambles into a mid-tempo march with a bluesy guitar solo. The vibe here is often mellow, and the production has a muted quality that translates—at least to these ears—as flat. Lots of fans swear by Goodbye Bread thanks to Segall’s embrace of psych swing, and you’ll see it near the top of these lists until the end of time. Just not this one. Released on the heels of his T. Rex covers collection and the second Fuzz album, Emotional Mugger feels like a transitional work. That’s not a bad thing; it still oozes catchy tunes, cozy synths and crackling noise for days. But it’s an album full of ideas and experiments, zigging when you expect a zag. Segall, who spent the better part of the tour for this album wearing an extremely creepy baby mask, seemed to be trying to wriggle out of expectations, or trying to figure out what to do next. Every once in a while, it sounds like he’s treading water. On Melted, Segall’s third-eye vision starts to come into clearer focus. The songs are, in some cases, bigger and beefier than his previous work, and also more dynamic (opening track “Finger,” for example, starts with some lazy strumming and cooing before it erupts into a thrashing tear-down). “Girlfriend” and “Imaginary Person” are two of his all-time best sing-and-clap-alongs. And “Bees” is a lovely range-revealing deep cut that recalls the kind of work Kurt Cobain was doing just before he died. Written and recorded after the death of Segall’s father and estrangement from his mother, Sleeper is perhaps the most cohesive and concentrated look at the other side of Ty. The songs here are performed mostly on acoustic guitars, with lyrics revolving around death and dreams and distance, and the volume never rises above a downcast roar. At the time, Segall told Billboard that “I couldn’t have written a loud, heavy song if somebody had paid me to.” Sleeper proved a nice break from Segall’s typical din, and a good reminder that there’s a lot going on behind those blown-out amps. After the somber Sleeper, the wandering Manipulator and the unspectacular Emotional Mugger, you could understand how fans of Segall might’ve worried that their man was running out of gas. Ty Segall put those worries to rest with a powerful, diverse pack of tunes that offered a reminder of Segall’s prowess as a pure guitar-rocker with a bottomless closet of melodies. It’s as if the prodigal garage-rock son went off on a spiritual journey to experience new things and make new sounds, and this—a second self-titled album, not coincidentally— is his return to the top of the mountain. Opener “Break a Guitar” is pure Marc Bolan riff wattage, while “Orange Color Queen” is an earnest love song (“Oh you’re the tree inside an airplane…”) with an acoustic heart and some of Ty’s best singing. After packing his catalog full of two-minute punk blasts and the occasional psych-folk outlier, Segall took by far the biggest step of his career on Manipulator. At 17 tracks and more than 56 minutes long, it dwarfs its predecessors not only in terms of sheer size, but also artistic scope. Promo photos from the album’s rollout feature Segall glammed up in glitter, and the album’s roiling brew—organ jams, drum breakdowns, acoustic blazers, funky passages, falsetto vocals—stretches him further than ever. Looking back, it’s clear that 2013’s Sleeper not only gave Segall an outlet for his personal despondence, it also opened a door to more stylistic exploration. Artists grow. It’s cool when you can actually see it happening. This album just came out Friday, but its high placement on this list is no joke: This thing rules. It’s a return of sorts to the sprawling, genre-hopping feel of Manipulator, but it sounds like a grown-up Ty Segall behind the wheel rather than an alter-ego still finding its voice. Freedom’s Goblin is chunky, funky and fully charged, with more soul, more horns, more synths, more freedom, more resources—more of everything. We thought we’d seen well-traveled, wide-screen Ty, and maybe we had. But Freedom’s Goblin sounds like the culmination of all the man’s journeys over the past decade or so. There have been several years when Segall put out more great music than many bands do in a decade. Add it all up and you’ve got one of the finest rock ‘n’ roll catalogs of the the 21st century. But every mountain must have a peak, and Segall’s peak—so far, at least—came in 2012, when he released Slaughterhouse, recorded with his longtime road band, in the spring; Hair, a collaborative LP with Tim Presley of White Fence, in the summer; and Twins, his very best solo album. Twins is a glorious funhouse of scuzzed-out pop, shimmering garage-rock, furious psych-punk, razor-sharp guitars, earth-moving low end and some of Segall’s strongest vocal melodies. Nestled in the middle of a career that contains multitudes, Twins both harkens back to Segall’s forebears in the West Coast skate-punk scene and sums up all that’s incredible about his own music.